Claudia Rankine is one of the most compelling voices in American culture, widely celebrated for her innovative poetic explorations of contemporary race relations. This is a unique opportunity to hear an exclusive reading from her new play The White Card, which explores racism in the art world and beyond. Following the reading, Rankine will be in conversation with artist and director P. Carl, the dramaturg of The White Card and Zoe Whitley, co-curator of the exhibition Soul of a Nation: Art in the Age of lack Power. The discussion includes a Q&A with the audience. This event is followed by a day-long conference on Friday 13 October that brings together acclaimed contributors from the UK and USA for a series of unique presentations and rich panel discussions that explore the art, artists and social histories featured in Soul of a Nation. 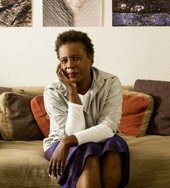 Claudia Rankine is the author of five collections of poetry, including Citizen: An American Lyric and Don’t Let Me Be Lonely; two plays including Provenance of Beauty: A South Bronx Travelogue; numerous video collaborations, and is the editor of several anthologies including The Racial Imaginary: Writers on Race in the Life of the Mind. For Citizen, Rankine won the Forward Prize for Poetry, the National Book Critics Circle Award for Poetry (Citizen was also nominated in the criticism category, making it the first book in the award’s history to be a double nominee), the Los Angeles Times Book Award, the PEN Open Book Award, and the NAACP Image Award. A finalist for the National Book Award, Citizen also holds the distinction of being the only poetry book to be a New York Times bestseller in the nonfiction category. Among her numerous awards and honours, Rankine is the recipient of the Bobbitt National Prize for Poetry, Poets & Writers’ Jackson Poetry Prize and fellowships from the Guggenheim Foundation, the Lannan Foundation, the MacArthur Foundation, United States Artists, and the National Endowment of the Arts. She is a Chancellor of the Academy of American Poets and teaches at Yale University as the Frederick Iseman Professor of Poetry. P. Carl joined ArtsEmerson (Boston, MA) as Director of HowlRound in 2012 and was named Co-Artistic Director in 2015. Prior, he served as Artistic Director of the Playwrights’ Center (Minneapolis, MN) and as Director of Artistic Development at Steppenwolf Theatre (Chicago, IL). With ArtsEmerson he has been the dramaturg of Claudia Rankine’s The White Card, Melinda Lopez’s Mala, Jesscia Blank and Erik Jensen’s How to Be a Rock Critic, and Deborah Stein and Suli Holum’s The Wholehearted. Carl recently received a 2017 Art of Change Fellowship from The Ford Foundation. He was named Theater Person of the Year in 2015 (National Theater Conference) as well as Alumni of Notable Distinction (University of Minnesota). He is currently a Distinguished Artist in Residence on the faculty of Emerson College. Carl earned both his B.A. and M.A. from the University of Notre Dame (IN) and earned his PhD from the University of Minnesota (MN).